Thought I'd add a touch of reality to these posts from paradise. So I am sharing a couple of topics that have made the news around here this last week. First, Honolulu has been under a 'vog' canope off and on since we arrived. Vog is the local term for a condition like fog, but made up of volcanic dust and debris. It is being brought to us by the Kona winds from the volcano on the same island. Trade winds, blowing the opposite direction, have come along for a couple of days and cleaned up the air, with both strong winds and a bit of rain, but by tomorrow there is talk of the 'vog' returning. Okay, so being from the Pacific Northwest, I have to admit we hadn't noticed it until people and the press alerted us to the conditions (which can cause problems for those with breathing ailments). This photo shows the cover at sunset. I mentioned a bit of rain which came the other evening: another headline alerted us to the fact that Hawaii is suffering from a drought. One of the other topics getting press is what we call in the Seattle area, "Tent Cities" the encampment of homeless folks in tents. 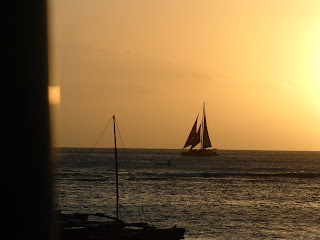 We saw such a city out in the Makaha area of the island last year and a few along the Northshore. This year more tents are visible in Fort Derussy Park and Kapi'olani, in the heart of Honolulu/Waikiki which has lawmakers debating how to address the problem. The latest being pondered is a fee for tents and abolishing grocery carts from the park (often used by homeless to carry their belongings). Again, we had been commenting on the number of 'campers' using the park last weekend. Good to have the press keeping us up to date on what's going on around us.